Common and at times abundant migrant in the western and central counties, rare to uncommon or irregular migrant elsewhere. During breeding season the head is black with a broken white eye ring. In nonbreeding season the head is white with a dark gray patch that extends around the eyes and the back of the head. The back of the neck is white. The bill and legs are orangish-red. The back and uppersides of the wings (mantle) is dark gray. The underparts are white. The primary wing feathers have a white band and limited black tips which appear as a black crescent on white wingtips when in flight. When at rest the wingtips appear black with large white spots. The underside of the wing white and unmarked except for the limited black wingtips and white band. Laughing Gull (Larus atricilla) is larger. The legs are black. Non-breeding adults lack the dark gray patch around the eyes and head. Grasshoppers, dragonflies, earthworms; mice; small fish; crustaceans; and sometimes seeds. This species was formerly placed in the genus Larus. Mitochondrial DNA analysis of all gull (family Laridae) species in 2005 (Pons J.M. ; Hassanin, A.; Crochet P.A. ) supported rearranging the Laridae into ten species. 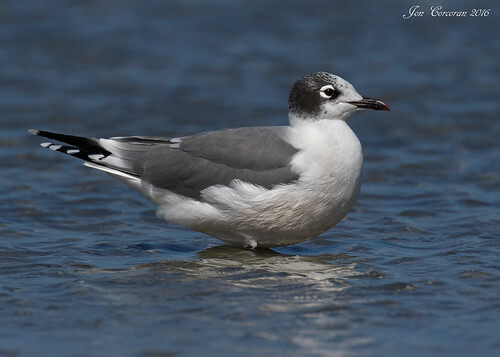 Franklin’s Gull and four other gulls were placed in the “hooded” species genus Leucophaeus. Franklin's Gulls face a gale-force prairie wind on a freshly-plowed field. Photographed at Grand Forks, North Dakota (13 May 2013). Migratoria. Anida en el hemisferio norte. Durante el invierno boreal migra hacia el hemisferio sur, pudiendo versele en Chile en grandes cantidades, especialmente en costas arenosas y desembocaduras de rios, entre Octubre y Abril. Tambien hacia las zonas interiores siguiendo los cursos de agua. Google translation: Immigration . It nests in the northern hemisphere. During the winter migrates to the southern hemisphere, may Versele in Chile in large quantities, especially in sandy shores and river mouths , between October and April . Also to inland areas following the waterways. Photographed at Kellys Slough NWR, North Dakota (09 May 2010). 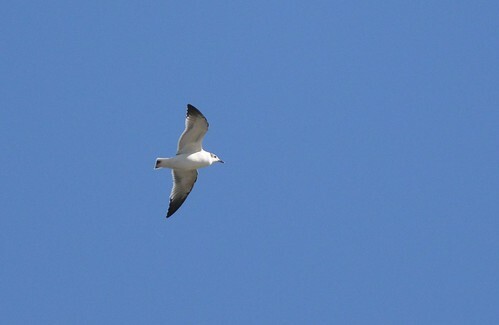 FRANKLIN'S GULL at Cley NWT! James McCallum watched this mega gull fly into roost on Pat's Pool from Teal Hide, Cley NWT at 8.23pm this evening. Took this video at 8.31pm, after phoning RBA and then three friends. A lifer for me! I've been on Gull Lake for nearly 60 yrs. Gulls are common, so don't pay too much attention to them. I was out in our pontoon this past weekend. I pointed out a gull with a black head to my husband because I dont recall seeing one before. It was floating around near us before taking off. Happen to see the name on your web site. It's also my son's name. Do you always visit state parks? Would you visit Fritz Loven Park? Or do they have to be larger? If this is one of your favorite parks, consider uploading some photos of the park (signs, facilities, lakes, trails, scenery, etc. ), and I will create a page for it on MinnesotaSeasons.com.